Banana Creme Brulee Tart Recipe - Let the Baking Begin! Banana Creme Brulee Tart is a Crispy Puff Pastry tart sprinkled with coarse sugar and brushed with chocolate, then filled with custard and topped with bananas. This is a perfect dessert to finish dinner. My house almost never has any store bought sweets like candy or cookies, so if I ever want something sweet I need to go into the kitchen and make it. Our local grocery store sells a tart that is filled with pastry cream and fruits, so knowing I had some puff pastry in the freezer I headed to the kitchen to recreate it. This is how this Banana Creme Brulee Tart was born. 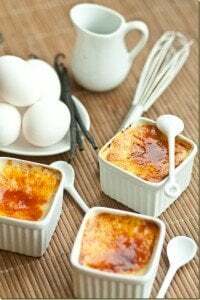 How to make Banana Creme Brulee Tart? 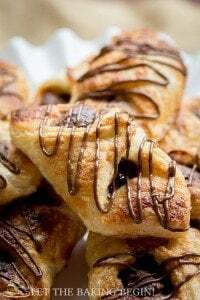 The idea was to use the puff pastry shell, brush it with chocolate to prevent the tart crust from becoming soggy, then to fill it with pastry cream and top with bananas. Burning the sugar on top of the bananas to melt it into a thin crust came once the tarts were all assembled. My ideas always sound good in my head, but not always they are as great as they sound when it comes to actually bringing them to life. This though, was aaah-maay-zing! I was worried that the bananas and the pastry cream would make this tart too bland, but the thin layer of chocolate and the caramelized crust brought a textural and flavorful contrast, that brought it together very well! The sugar on the bottom of the crust added a slight crunch, which I really liked, but I do wish that my sugar was just plain white sugar, not the yellow sprinkling sugar I had on hand. Give these tarts a try and let me know what you think in the comments below! I would love to hear your thoughts on this combination! 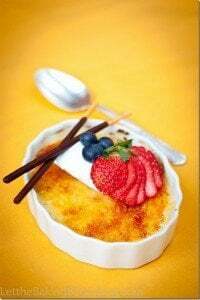 Grapefruit Creme Brulee – The best dessert with grapefruit. 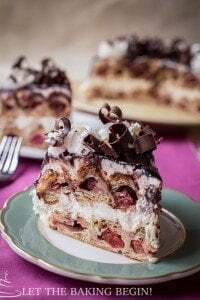 Chocolate Banana No Bake Custard Cake – Simple no-bake cake with creamy custard. Coffee & Chocolate Pot de Creme – Delicious coffee dessert. Whisk the egg yolks with sugar, flour and 2-3 tablespoons milk. Bring the remainder of milk to boil. Slowly add hot milk into egg mixture, tempering egg yolks. Pour egg/milk mixture into a saucer and cook on medium heat, stirring constantly, until mixture comes to boil. Cook for 2-3 minutes, until custard thickens. Pour the custard into flat dish, cover with plastic wrap and let cool to room temperature. Transfer to fridge and chill for 1 hour. (Do not transfer warm into the fridge or it will not thicken). Once the tart shells are ready to be filled, add vanilla extract and stir. Add the cool whip in 3 additions and fold together until no streaks of cool whip are seen. Let puff pastry dough thaw. Turn the oven to 400F. Line a baking pan with parchment paper, set aside. Cut out 6 inch circles and drape over upside down 5 inch round tart mold (you can cut out smaller circles and drape them over upside down muffin tin). Whisk the egg white & water. Brush the tart tops (but this will eventually be the bottom of the tart) with egg white and generously sprinkle with sugar. Bake for 15 minutes or until the top is golden. Remove the baked tarts from the muffin tin and if need to, put them back in the oven for 3-4 minutes, bottom side down this time and allow the inside of the tart to bake through. Remove from the oven and let cool. Bring cream to boil and pour over the chopped chocolate (or chocolate chips). Let sit for 2-3 minutes, then stir until smooth. With a teaspoon, cover the inside of the tart shells with about a tablespoon of chocolate, completely covering the bottom and the sides of the tart. 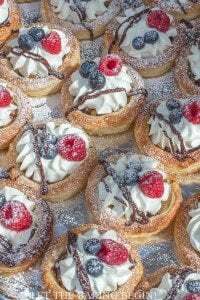 Spoon the pastry cream into the tartlets, dividing evenly between the tarts. Cut the banana into thin slices and arrange them on top of the spooned pastry cream. Generously sprinkle the bananas with sugar (about 1 tablespoon) and caramelize the sugar with a blow torch. Serve right away (the bananas will turn dark and the caramel will weep if done in advance).